The Gawler people worked through the night to restore the looks of John Kennedy. Although his face was undamaged, his hair and head needed repair. By pre-dawn they were finished and the motorcade back to the White House was ready. Once again Agent Greer drove while Robert and Jackie Kennedy rode in the back of the ambulance with the slain President. By 4:30 a.m. EST, President John F. Kennedy had returned home to the White House for the last time. An honor guard representing all branches of the services carried the President to the East Room. They would stand guard along with two priests as he lay in state. As per Mrs. Kennedy’s request, the East Room of the White House had been transformed into a modern recreation of the room as it had looked for the mourning of Abraham Lincoln. His original catafalque had been found and it was there to receive the 35th President. Black crepe was draped around chandeliers, doorways and windows. There would be debate as to whether an open casket was requisite for a head of state. 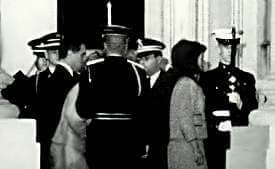 Mrs. Kennedy was adamant that he not be seen and eventually all close to her agreed. The general opinion was that while the Gawlers had tried, the President looked too made up, too waxen. There was speculation in the press about this and they wondered if something was being hidden.The truth was that the man had part of his head blown off and no amount of funerial skill could make the young vibrant Kennedy look natural in death. At 10:00 a.m. there was be a private mass for family and close friends at the flag draped coffin. Later that day, people from the Executive Branch, the Supreme Court, the Senate and Governors and diplomats were invited to pay their respects. During this Saturday the new President, Lyndon Johnson would attempt to provide continuity in government. 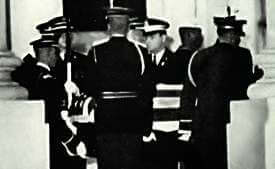 His first act was a proclamation making Monday, November 25, 1963 a national day of mourning. He met with former Presidents Dwight Eisenhower and Harry Truman, the Cabinet, Congressional leaders, foreign dignitaries. Controversy remains as to the departure of President Kennedy’s personal effects from the Oval Office, a reflection of the segregation of Kennedy and Johnson people. Kennedy people were shocked to find they had to have the dead President’s things out of the Oval Office in the AM of that Saturday. President Johnson’s people were urging him to occupy the Oval Office as a symbol of the seamlessness of government. Kennedy clansmen saw it as aggressively insensitive. President Johnson did not move into the Oval Office until the day after the funeral, but Kennedy’s secretary, Evelyn Woods, did a herculean job getting his things removed by noon on Saturday. Kennedy’s two rocking chairs so closely identified with the young President, were unceremoniously strapped together and hauled out a side door. The remainder of the day was spent in planning the funeral. Secretary of Defense Robert McNamara would make 4 trips to Arlington National Cemetary to select a burial spot and make arrangements. On some of those trips, Kennedy family members including Jackie came along, saw the beautiful spot and approved. It rained the day of November 23 as befitted the mood of a nation. Mrs. Lincoln was John Kennedy’s secretary from the day he entered the Senate in 1953 to the day he was assassinated in November 1963. By all accounts she was an able assistant. Included in her collection was the watch the President was wearing in Dallas and objects from the Oval Office. She even had one of Jackie Kennedy’s signature pillbox hats. Through the years, she created a sort of secret shrine to him. Until her death at age 85 on May 11, 1995, no one had any idea of what she had hidden away Clearly, profit was not her motivation. The Kennedy children thought she had given most of the items to the John F. Kennedy Presidential Library in Boston. Instead, Evelyn Lincoln left them to her husband and upon Mr. Lincoln’s death, they were left to a family friend and collector, Robert L. White. In 1998, Mr. White had no “secret shrine” ideas. He wanted to auction the things. Eventually, an agreement was reached with the Kennedy children to return some items.